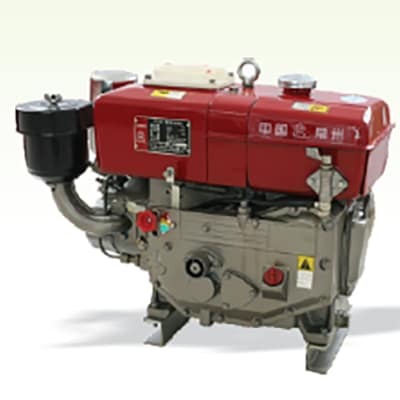 Water cooled and air cooled diesel engine. - Kirlosker / lester / perkins diesel engines. Water cooled and air cooled diesel engine. - Kirlosker / lister / perkins diesel engines. Perform best in medium to high-intensity order picking and pallet handling warehouse operations. Man-up VNA truck. Load capacity up to 1.35 ton. 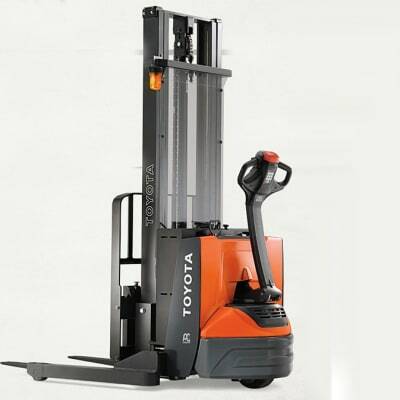 Lift heights up to 13.6 m. Optimised drive speed to lift height. Made for light-duty towing and order picking applications. The stand-in tugger has a narrow designed chassis and low step-in height for easy entry and exit. Stand-in towing tractor, 1 ton towing capacity. 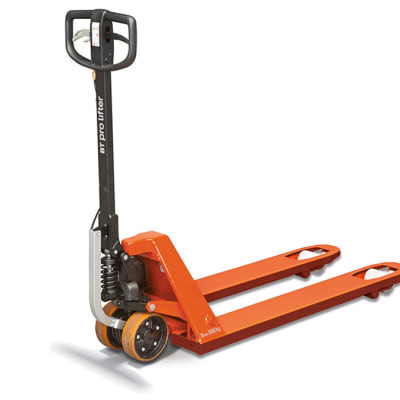 Suitable for horizontal pallet transport, loading/unloading and order picking, the low lifting hand pallet trucks in the BT Lifter L-series offer a load capacity of up to 3 ton. Taking the Flexi concept to over 14 metres. 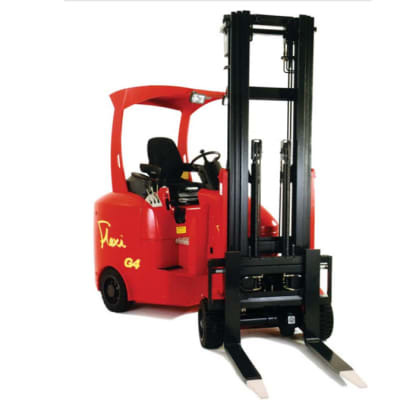 Specially engineered to combine narrow aisle operation, with lift heights demanded by today’s logistics industry. 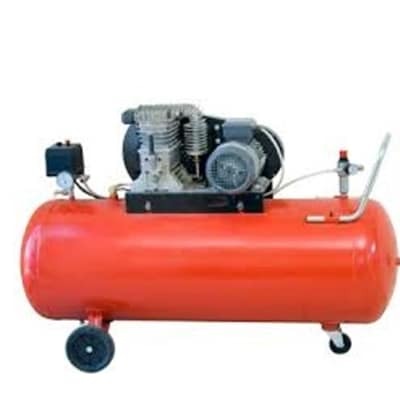 Provides extra load rating and stability. Logistics warehouses need faster throughput capability and high-density storage; the Flexi AC Very Narrow aisle truck provides the perfect solution. lifting pallets to over 11 metres of lift. 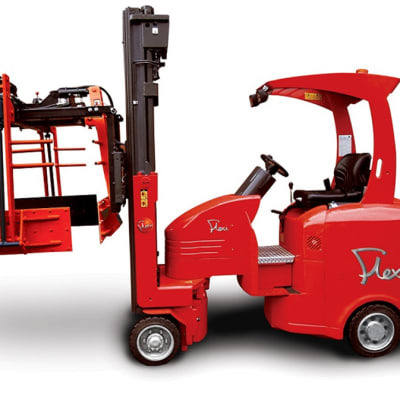 Flexi AC 1000 provides an economical solution for low bay warehouses, where high lift performance is not required and a more compact articulated forklift truck is more suited to the application. 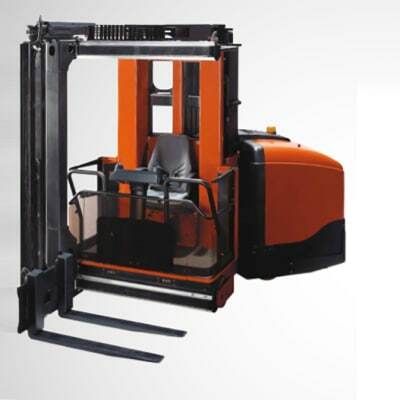 A multi directional forklift that eliminates the need for right-angle turns, reducing the aisle width needed for long load handling and bulky loads. 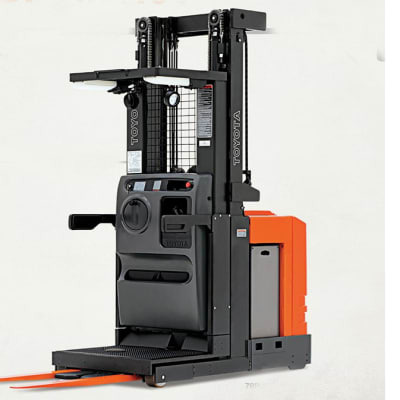 This narrow aisle forklift features a unique four-directional travel mode. Allowing double-deep pallet storage in the racks for increased storage density. 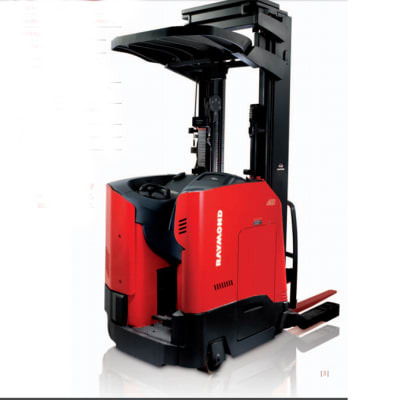 Raymond double deep reach forklifts are available with your choice of compartment configuration — Universal Stance, sidestance reach truck or sit-down reach truck. 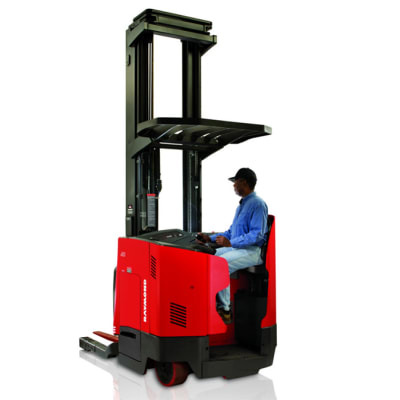 Enhances operator comfort in narrow aisle applications with long travel distances. 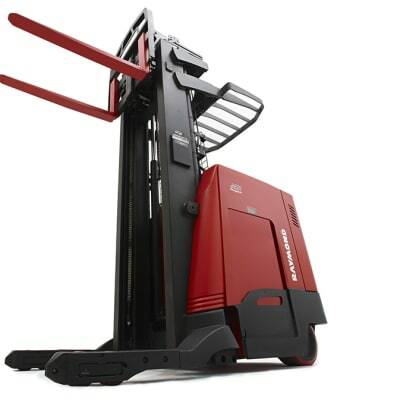 The Sit Down Reach truck allows the operator to change positions for postural relief over the course of a shift. 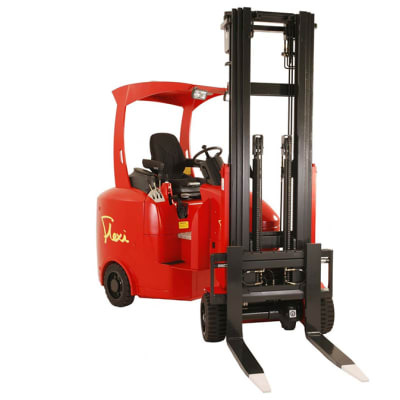 Ideal reach forklift for dock areas and applications with shorter travel distances and lower lift heights. 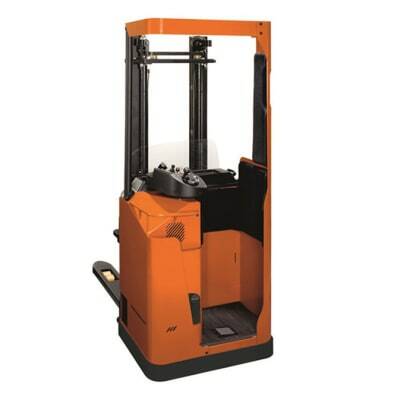 Operators accustomed to the side-stance operation will appreciate the performance, visibility and ergonomic features of the Raymond 7500 side-stance reach forklift. 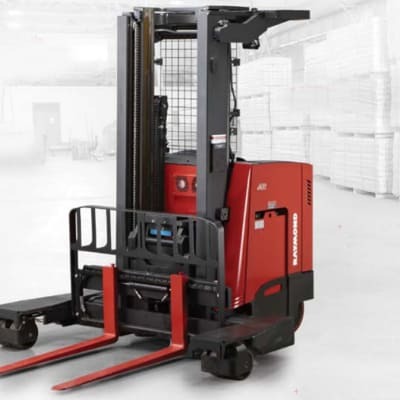 With exclusive Universal Stance design and patented open view mast, the 7500 narrow aisle forklift provides greater visibility whether travelling or load handling and is ideal for narrow aisle and high rack applications. 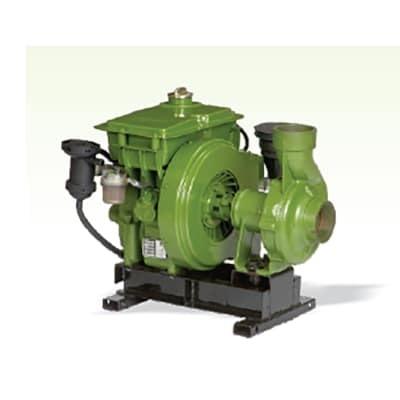 Engineered to handle a broad range of applications—from small footprints to maximum throughput needs. With our exclusive ACR System and battery compartments ranging from 14 inches to 21 inches, you can move more product faster with a truck designed for your application. Engineered to fit your narrow aisle application with multiple configurations and smaller battery compartment options to right-size your operation and reduce energy costs. 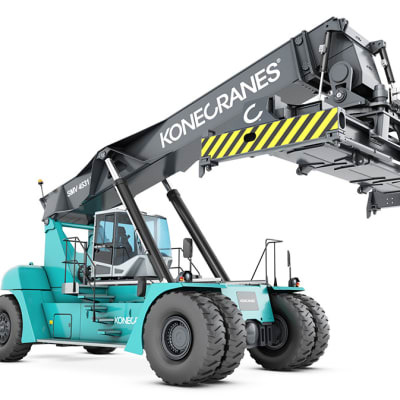 Whatever the lifting capacity you need, 10-18 tons, 18-33 tons or 37-65 tons, Konecranes has the right fork lift for you with the right package of options and attachments. 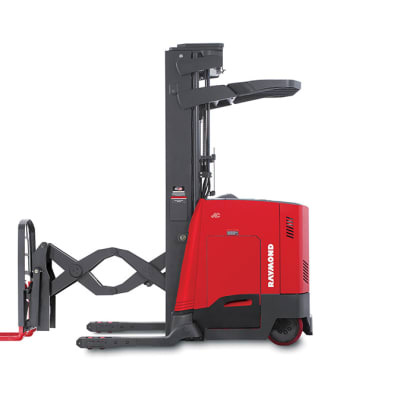 Konecranes fork lift trucks are remarkably adaptable to specialized material handling. Built on a special heavy-duty, box-type chassis that withstands the harshest container handling conditions. Built on generations of customer feedback and application knowledge. 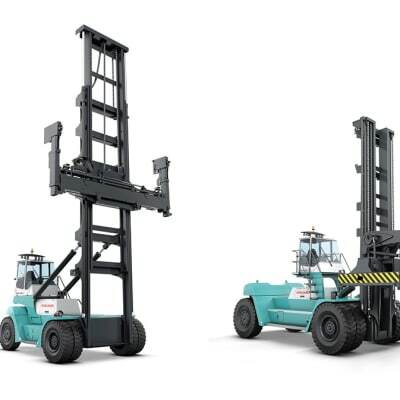 From nimble, compact empty container stackers to the laden container and industrial heavyweights, we have the ideal reach stacker for your particular application. 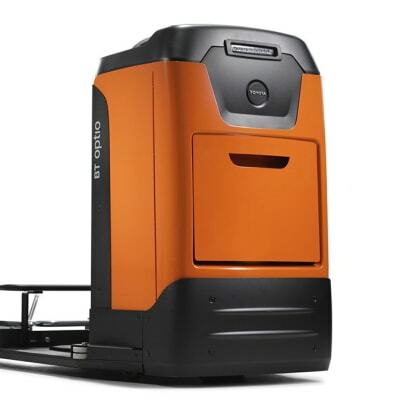 Makes pulling product through the warehouse or distribution center easy and convenient. 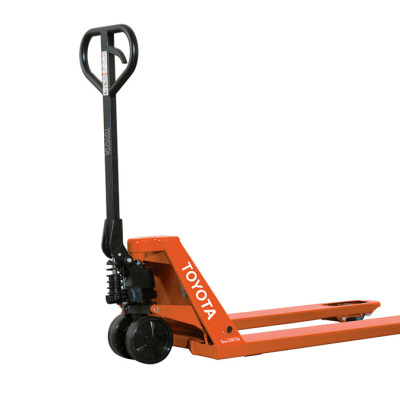 With low noise levels and low rolling resistance, the Toyota Hand Pallet Jack is the ideal solution for quick material handling jobs. 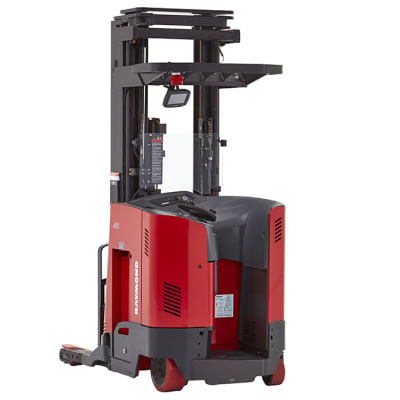 When a traditional forklift isn’t necessary but lifting product above a second-tier rack is, the Toyota Industrial Stacker is a cost-efficient, easy-to-use solution. 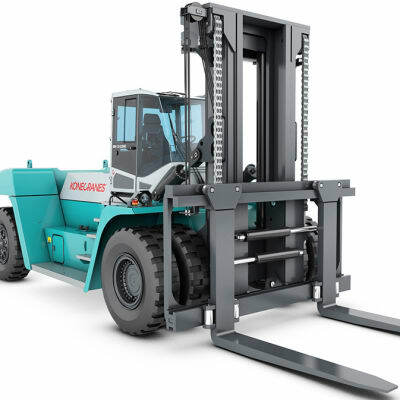 With top-of-the-line durability and long-run performance, the Industrial Stacker is an economical compliment to nearly any forklift fleet. Offers a manoeuvring solution to go right to your product and pick what you need. With the ability to self-diagnose, the order picker is easy to maintain and uniquely customized for your specific narrow aisle.